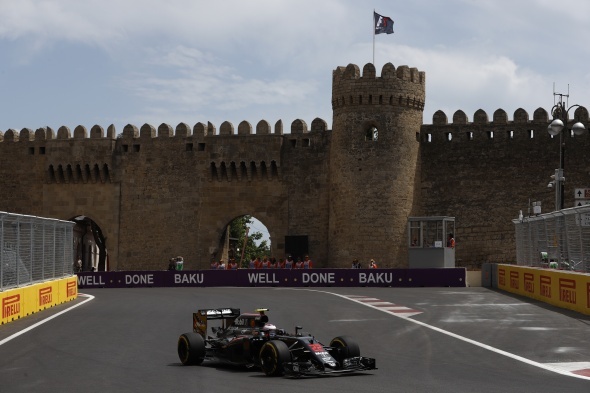 Jenson Button was left to rue a surprise exit from the first stage of qualifying at the European Grand Prix in Baku. Button was only 19th quickest during Q1 after running wide at Turn 15, which left him with worn tyres as he attempted a second run. Button was unable to improve on his time and will start the race ahead of only Sauber's Marcus Ericsson and Renault pair Kevin Magnussen and Jolyon Palmer. "In Q1, I locked up into Turn 15 – we’d fitted new brakes ahead of quali, which we always do, but they were a bit more ‘grabby’," he said. "It’s a real shame because I’d been seventh or eighth all weekend – and while I’m not sure we’re that quick, we’re definitely not 19th either. "It isn’t easy around here because of the traffic, but after I’d flat-spotted, I did a donut to spin the car back around, and that isn’t usually the best thing for these tyres. "So we should have come in and fitted a fresh set of tyres for the rest of Q1. We thought we’d have more of a margin – but that wasn’t quite the case. " Fernando Alonso will start from 14th position and reckons McLaren was unlucky with the way the session unfolded. "While we didn’t quite have the pace to get into Q3 today, because other teams are able to turn up their engines, we didn’t maximise our potential either, as I believe we could’ve qualified a little bit better than 14th," he said. "On my final Q2 lap, there was a yellow flag at Turn 3 for around 15 seconds, which meant I couldn’t open the DRS, so I lost a couple of tenths. "I also think we probably didn’t get everything right ourselves – we were a bit unlucky, because we encountered traffic and were out of sequence with the cars around us."